"We Strive For Quality Education And Training For All"
2018 TFF Payment List for National High, Secondary and Provincial High Schools. The Secondary/High Schools have been paid their 2018 payments in 2018 and 2019. The Government is paying to schools, hence its position that no student is to pay any other forms of fees and make it a condition for enrolment still stands. EDUCATION MINISTER EXPRESS DISAPPOINTMENT OVER SCHOOLS CHARGING FEES. Minister for Education, Hon. Nick Kuman, MP has expressed his disappointment over principals and school boards who are defiant and not complying to lawful instructions not to charge any form of fees. The purpose of this Circualr Instruction is to advise all concerned stakeholders and teachers that the Phase 1 Teachers NID Registration rollout concluded on the 25th January 2019. The response was very positive and is commended. All teachers and public servants of the Ministry of Education are hereby advised to immediately register for the National Identification Document (NID) of NID Card and Birth Certificate. PRESS STATEMENT - Secretary Dr. Uke Kombra has announced the 2019 term and holiday dates for parents and guardians to prepare in advance for their children’s education. Screening of Applications for DoE/Donor Sponsorship for both short and long term training/courses in country and overseas. Both training committees of the Department (SDC/EDC) meets, screens applications and make decision. Outcome of the decision is communicated to individual officers. Heads of institutions to complete and forward monthly staffing returns for March to PDoE and NDoE GESD. 1st Quarter Meeting for Principals of TTCs & IERC Coordinators/Principals. 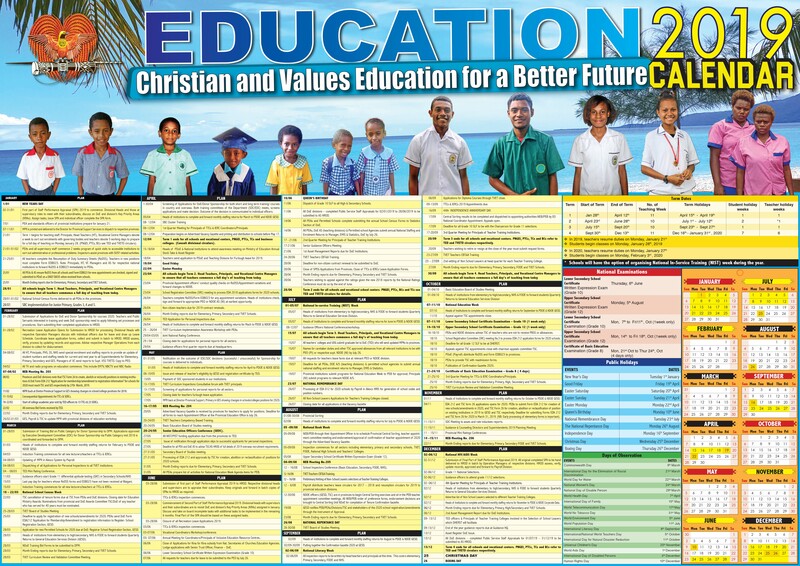 Preparation begins on Advertised Vacancy Gazette and printing and distribution to schools before May 17. Heads of PDoE & National Institutions to attend awareness meeting on Ministry of Education Annual Stock Take & Asset Register. Teachers send application to PDoE and Teaching Divisions for Furlough leave for 2019. All schools begin Term 2. Heads Teachers, Principals and Vocational Centre Managers to ensure that all teachers commence a full day's of teaching from today. Provincial Appointment Officers conduct quality checks on RoDSS/Appointment variations and forward changes to NDoE. School Registration Committee (SRC) meeting to process EDA 2018 application forms for 2020 schools. Teachers complete RoDSS/Form EDB023 for any appointment variations. Heads of institutions check, sign and forward to appropriate PEO or NDOE AS (NI) at earliest opportunity. Non-citizen teachers due for 2019 contract renewals. Month Ending reports due for Elementary, Primary, Secondary and TVET Schools. TED Application for Personal Inspections due. Heads of Institutions to complete and forward monthly staffing returns for March to PDoE & NDoE GESD. TVET Curriculum Implementation Awareness Workshop with PEAs. Closing date for applications for personal reports for all sectors. Guidance officers first quarter reports due at headquarter.